The chair of NACCHO Justin Mohamed today congratulated the new senator for the NT Nova Peris who has become the first Aboriginal woman to win a seat in Australia’s Parliament. SYDNEY (AFP) – Former Olympian Nova Peris has become the first Aboriginal woman elected to Australia’s national parliament, a welcome achievement for the centre-left Labor Party which lost power in the polls. Employment and workplace relations minister Bill Shorten, who is considered the frontrunner to become Labor’s next leader, said despite the loss, there had been a range of good candidates elected to serve, including Peris. Olympian Peris won gold in field hockey at the 1996 Atlanta Games before switching to athletics to win gold in the 200m and 4x100m relay at the Commonwealth Games in Kuala Lumpur in 1998. 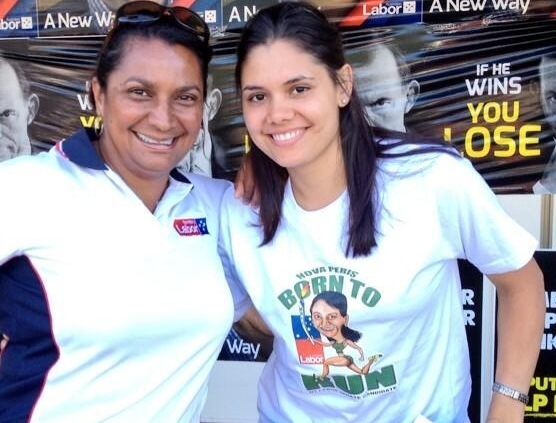 Her pre-selection ruffled feathers though, with one conservative Aboriginal politician saying Labor had been shamed into pre-selecting an indigenous candidate and compared the politically inexperienced Peris to a “maid” inside Labor’s house. Others were angered that her pre-selection bumped out Labor’s long-serving Northern Territory Senator Trish Crossin. In her victory speech on Saturday, Darwin-born-and-raised Peris said that federal politics had the same cruelness of elite sport and admitted she had thought “long and hard” about whether to enter the arena. “I thought: ‘Can I do it? '” she told supporters on Saturday night. Peris, who identifies with the Kiga People of the East Kimberley, Yawuru People of the West Kimberley (Broome) and Muran People of West Arnhem land in the Northern Territory, is set to be sworn in as a senator at the next sittings in Canberra. Facing the prospect of becoming the first Aboriginal woman to win a seat in Australia’s Parliament, Nova Peris said Sunday that she was targeted during her campaign by the worst onslaught of racial abuse she had ever endured. After then-Prime Minister Julia Gillard hand-picked Peris in January to head the center-left Labor Party’s Senate ticket in the Northern Territory _ an almost unbeatable position that virtually assured her place in Australian political history _ she was bombarded with hate letters and emails that were so extreme she passed them to police. “They were pretty nasty. The worst I’ve ever seen in my life,” she said, declining to go into details. But the threats did not deter her, and the 1996 Olympic gold medalist hockey player contested the Senate seat in elections Saturday. She appeared comfortably ahead in vote counting Sunday, but was not yet ready to claim victory. “It’s like waiting for the result of a photo finish,” said Peris, comparing her anxious wait for the count to be finalized to her days as a world-class sprinter. Aborigines are a minority of only 600,000 in Australia’s population of 23 million. The lack of Aboriginal representation in Parliament is a growing embarrassment for the leaders of major political parties. No Aborigine had sat in Parliament before Neville Bonner arrived in 1971. The conservative Liberal Party senator, who had little formal education, was the only Aborigine in Parliament for the next 12 years before he was voted out. In 1999, Aden Ridgeway, a senator from the minor Australian Democrats party, became the second Aborigine in Parliament, lasting for a single six-year term. Liberal Ken Wyatt next won a seat in the House of Representatives in 2010, although a constituent later wrote to complain that he had not advertised his Aboriginality in the campaign. The constituent said he would not have voted for Wyatt if he had known. Wyatt was re-elected Saturday to a second three-year term in his Western Australia state electorate, with an increased majority. Adam Giles became the chief minister of Peris’ home state last year, and became the first Aboriginal head of a government. Aborigines are the poorest ethnic group in Australia, suffer poor health and lag behind in education. They die years younger than other Australians on average and are far more likely to be imprisoned. Prime Minister-elect Tony Abbott has promised to work for a week each year as the nation’s leader in an Outback Aboriginal settlement to draw attention to indigenous struggles. He failed last year in a bid to recruit an Aboriginal woman lawmaker from the Northern Territory government to contest a federal seat. Peris, a 41-year-old who competed in two Olympics _ as a hockey player in 1996 and as a sprinter in 2000 _ said she experienced racism throughout her sporting career. But the racism was worse in Australia than when she traveled internationally to compete. She said she was pleased, however, that Australia’s major sporting bodies no longer tolerate racism of competitors or spectators. Amid all the excitement and celebrations of Nova being elected, people of the territory must remembered that she has lied already. On Friday, the day before the election she came out in support of Labor’s “Better Futures’ program for aboriginal people. Up until then she has against this policy and the northern territory invention and all it’s abuses of aboriginal people. But she did a Howard and Abbott by stating her true position the day before the election hoping that no one will notice. Nova has just shown everyone that she will follow the party’s decisions on aboriginal issues and is no longer an advocate of aboriginal rights and irrelevant to any and all serious debate on aboriginal rights. On being elected, she should not have cried but should have been focused on the challenge ahead of her. But crying just indicates it’s all about Nova and her her dream being elected into white Australian political system which created and sustains aboriginal third world and inter-generational poverty.